Introducing our New Republic Gun Safe series. Now “Assembled in the USA”. Compare our top-of-the-line Republic Gun Safe Series with comparable products sold by our competitors – and you’re in for a big surprise. Our Republic Gun Safes are reinforced with 300% thicker steel than other leading brands. It’s like keeping guns inside a Sherman tank. The Republic Series is UL (RSC) Rated and comes standard with a pocket door organizer. 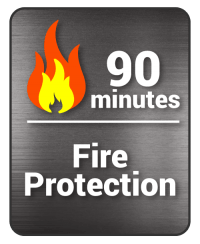 Each safe has a 1/4″ steel plate door and as a result of this you can’t beat the quality or the price. They are also now 2 Hours Fire Rated (Except RG-12) at temperatures of up to 1400° F external and 350° F internal. Each Republic Gun Safe now comes standard with our industry setting bolt length at over 90% more than the industry standard. In addition to having longer bolts each Republic Gun Safe also now comes standard with our new anti-pry features including our new Bolt Armor. The Bolt Armor and anti-pry features were designed in a combined effort with the engineers at Underwriters Laboratories in an effort to further reduce the likelihood of our Republic Gun Safes ever being pried open. We can’t say that it will never happen but good luck with that! The Bolt Armor is made of food grade stainless steel and fits around each locking bolt to not only enhance the security of the safe but also adds a superior look. (10) 1 1/2″ Steel Bolts (10) Active Locking Bolts. Well made and delivered and placed right were I needed it.